Senate Majority Leader Harry Reid wants a final vote on the Senate health care bill before Christmas. Washington (CNN) -- Partisan tensions exploded Friday as Republicans laced into Senate Majority Leader Harry Reid's possible plan to unveil a revised Senate health care bill over the weekend and pass it before Christmas. The self-imposed holiday deadline loomed large as Reid struggled to win the support of socially conservative Nebraska Democrat Ben Nelson and unify his fractious 60-member caucus. If the minority GOP remains solid in opposition, the backing of every member of the Democratic caucus will be required to end Senate debate on the bill and proceed to a vote on final passage. Final Senate passage -- potentially scheduled for Christmas Eve -- would then require a simple majority of 51 votes. Adding to Reid's complications is growing anger among liberal activists about compromises made to win the backing of more moderate Democrats. Congress is also waiting for a critical new cost analysis of the revised bill by the nonpartisan Congressional Budget Office. "This massive piece of legislation that seeks to restructure one-sixth of our economy is being written behind closed doors, without input from anyone, in an effort to jam it past not only the Senate, but the American people before Christmas -- an artificial deadline," said Senate Minority Leader Mitch McConnell, R-Kentucky. Video: Health reform by Christmas? "Every American will be affected by this missing bill. ... No one will have had an opportunity to read it and to understand it" before the vote. The critical first vote to cut off debate could come as early as 1 a.m. Monday, according to top Senate aides. The unusual timing is a consequence of Senate rules for legislative debate and Democrats' strong desire to pass the bill before adjourning for the year. This "isn't change you can believe in," said Sen. John McCain, R-Arizona. "There is no change. This is business as usual." McCain complained that while "every single major reform bill that's been passed in the history of this country has been bipartisan ... there's no bipartisanship here. There's no negotiation. There's no conversation." A key obstacle for Reid is Nelson, who on Thursday rejected compromise abortion language in the health care bill. Nelson has said he cannot support the Senate bill without tighter restrictions on federal funding for abortion. The Senate last week defeated an amendment proposed by Nelson and two other senators that would have adopted the tougher language on abortion funding contained in the House health care bill. The Senate bill as currently written would restrict government money from being used for abortions by segregating taxpayer-funded subsides from the private money that women pay for premiums. The more rigid House bill, in contrast, would prevent insurance companies that receive any federal subsidies from offering abortion coverage. Nelson has said that attempts in the Senate bill to keep private and public funds apart amount to little more than accounting tricks and don't live up to long-standing government practices that prevent federal funds from paying for abortions. He's said that a compromise on the abortion language is possible, and he's working to find a solution with Sen. Bob Casey, a socially conservative Pennsylvania Democrat. But abortion rights opponents in Nebraska, with whom Nelson has been conferring, have called the attempts to find a middle ground on the issue this week "entirely unacceptable." "There are revised concepts rather than provisions," Nelson told reporters Friday. "They are the kind of concepts that would exclude any kind of federal funds either directly or indirectly from being used to fund elective abortions. The question always is how do you get them as tight as you can and still get a common understanding and something you can all agree to." Nelson said it's too early to know how he'll vote on the bill. Negotiations are expected to continue Saturday. 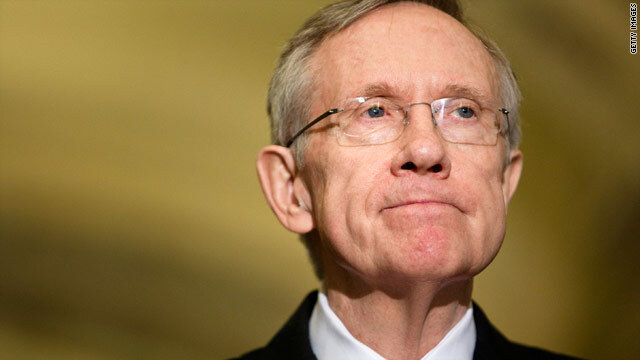 As Reid works to bring Nelson on board, he also needs to worry about keeping increasingly disaffected liberals in line. Former Democratic National Committee Chairman Howard Dean came out against the bill earlier in the week. Dean said, among other things, that the bill had been gutted by Reid's decision to eliminate both a controversial government-run public health insurance option and a provision allowing 55- to 64-year-olds to buy into Medicare. The move was necessary to win the support of moderates such as Connecticut Sen. Joe Lieberman, an independent who caucuses with the Democrats. On Thursday, two unions with significant influence in Democratic politics -- the AFL-CIO and the Service Employees International Union -- issued statements criticizing the revised bill. Neither union, however, indicated an intention to oppose the measure. Sen. Bernie Sanders of Vermont, one of the most liberal members of the chamber, said earlier in the week that he was not sure he could back the bill. "The final bill won't include everything that everybody wants. No bill can do that," President Obama said Tuesday after meeting with Senate Democrats. But "we simply cannot allow differences over individual elements of this plan to prevent us from meeting our responsibility to solve a long-standing and urgent problem for the American people." Former President Bill Clinton released a statement Thursday urging congressional Democrats not "to let the perfect be the enemy of the good." If the Senate eventually passes a health care bill, its version would have to be merged with the version the House of Representatives passed in November, which includes a public option. The final bill would then need approval from both chambers before going to Obama to be signed into law.